^ Lakhtakia, Akhlesh; Salpeter, Edwin E. Models and Modelers of Hydrogen. American Journal of Physics. 1996, 65 (9): 933. Bibcode:1997AmJPh..65..933L. doi:10.1119/1.18691. 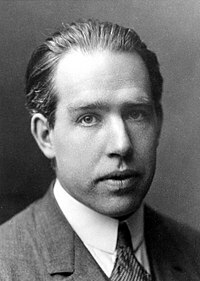 ^ Niels Bohr. On the Constitution of Atoms and Molecules. Phil.Mag. 26(1913)1. ^ Niels Bohr. Systems Containing Only a Single Nucleus. Phil.Mag. 26(1913)476. ^ Niels Bohr. Systems Containing Several Nuclei. Phil.Mag. 26(1913)857. ^ W.Heisenberg. Physics & Beyond. Harper & Row Pub. (1972)75.